The Wing Riders Western Cape Chapter was established in 1983. The Chapter is currently a strong group of 46 members. The Chapter has a monthly run scheduled for every third Sunday of the year, except for October, when we have the annual week-long Wing Fling, and in November, when we have our Progressive Run and year-end function. During the year, we do two weekend runs which take us away from home for two days – one run to Lambert’s Bay or Oudtshoorn, and the other one to Kakamas in the Northern Cape, which event is called the Mini Wing Fling. From time to time, the Chapter joins charity runs to various places around the Western Cape whereby we give and support the underprivileged and the aged. It is important to note that the Western Cape generally experiences poor support by Honda agents regarding repairs and/or services for the Honda Gold Wing. We have a few members with the necessary expertise who can assist in this regard and who will go above and beyond to help fellow Wing Riders in the Western Cape. Since members are widely spread from Kakamas in the Northern Cape to De Doorns in the Hex River Valley, we often have ad hoc meetings, but do communicate on the days we have our runs. 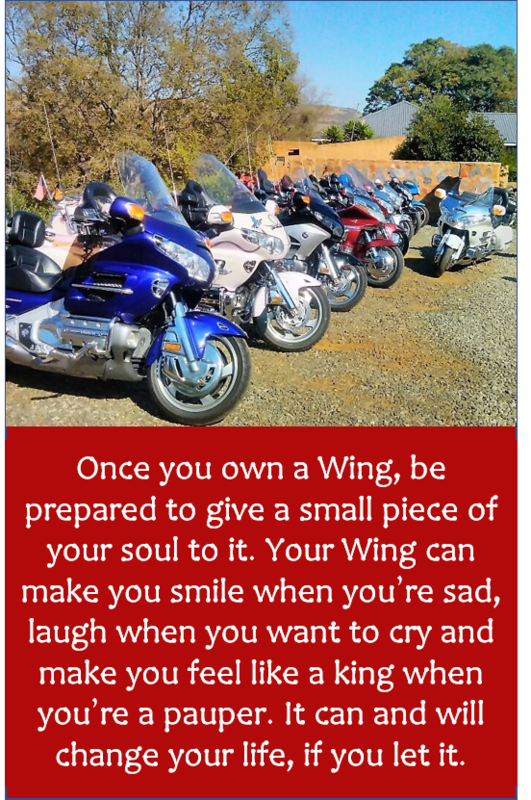 Membership is voluntary and available to anyone, irrespective of race, colour or creed, provided that you own a Honda Silver Wing or Gold Wing or Valkyrie. We will allow potential members to do three club runs with our members and thereafter your membership will be discussed by the Executive Committee of the Western Cape Wing Riders. Once approved, you will be handed your club colours (badges) and you will then be a member who is required to adhere to the Code of Conduct of Wing Riders SA. We look forward to welcoming you to the Western Cape Chapter.